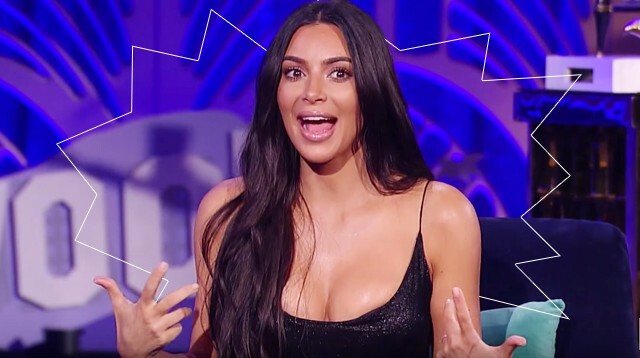 Kim Kardashian sat down with Andy Cohen on Sunday's What What Happens Live and so you know things got very real. That's Andy's brand! He just loves to get real with celebrities! An audience member asked if the Snapchat-facilitated fight between Taylor Swift and Kim had created any awkwardness between Taylor and Kendall Jenner, Kim's half-sister and reputed T.Swift squad member. Kim said, "I don't know if Kendall was a part of her squad. I don't think she was. Yeah, so, I don't think it was awkward." Andy asked Kim the reason for her ill-fated, short-lived marriage to basketball star Kris Humphries. "I just thought, 'Holy s—, I'm 30 years old, I better get this together. I better get married," she said. "I think a lot of girls do go through that where they freak out thinking they're getting old and have to figure it out, all their friends are having kids. It was more of that situation." Andy asked Kim what chance there was that Kris would ever speak to her ex Caitlyn Jenner again. "Zero," Kim initially replied, because changing her tune slightly: "No, one. No, I would say two percent." "You know, I feel like [there was] a lot of drama, and it doesn't mean he's a bad person at all," Kardashian replied. "And what was great was that it was so easy, that split. There has not been any drama with her since." There you have it! We have officially watched what happened with Kim Kardashian. Yay us!